Repast is a ensemble comprised of four musicians—a violinist, cellist, bassoonist, and harpsichordist—whose musical and personal affinities are so strong that we formed a chamber music ensemble despite the rather inconvenient fact that there is not much repertoire for that instrumentation. Our ensemble specializes in the performance of Baroque music and we often include guest instrumentalists and singers to present a wide variety of repertoire, both well-known and obscure. Our name, alluding to a meal or a feast, plays on the idea that a great musical experience should feel like a fabulous meal, and we aim to offer our audiences a taste of the rich and colorful flavors of Baroque music. Our CD is now available for purchase! Repast has been described as “a graceful, energetic ensemble” by the The New York Times, which also cited the ensemble’s "vital performances" and “robust” playing. A fan recently raved, “I think Repast plays with something of the spirit of a rock band. They play off each other with great alacrity, and their music swings, as I believe baroque music was intended to do.” (Claude Scales). Founded in 2003 in New York City, Repast has performed as part of Miller Theatre’s Bach and the Baroque series, Bargemusic, the Miami Bach Society, the Minneapolis Institute of Arts, Peak Performances, and at the Getty Center in Los Angeles. The group produced a concert series at Baruch Performing Arts Center during its first 12 years, and in 2015 added a concert venue in Brooklyn Heights. In 2016, Repast began performing at Advent Lutheran Church on Manhattan's Upper West Side. Repast's first CD, "Repast," is aired frequently on radio stations nationally. 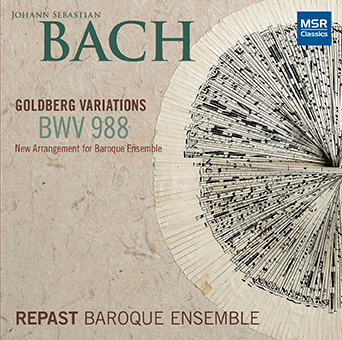 A new recording of their own chamber arrangement of Bach's Goldberg Variations will be coming out in 2018. Repast’s musicians are committed educators and have presented workshops and lecture-demonstrations at the College of William and Mary, Columbia University, the Brooklyn Conservatory of Music, and Baruch College.